Always know where you are going, unless a handcart is involved. First of all, let's get familiar with some landmarks. You can't just get in there chopping away willy-nilly or you will cause a problem. Everyone who has ever contemplated trimming nails is familiar with the term "the quick". It's not really anything mysterious. The quick is just the center of the nail where the nerves sit and where the blood supply for the nail cells lies. We call it a "vascular" structure, meaning that it has lots of blood vessels. Not surprisingly, when you cut into a structure with nerves and blood vessels, it hurts and bleeds. We like to avoid doing this as much as possible, but everyone hits the quick once in a while unless they are leaving the nails long or doing a tip trim. You will be trimming 18 or more nails every 4 weeks for your dog or cat's life. Call it 2,500 nails. Chances are good (on a dog) that at least once you will go a little short. Cats are easier, and most people can avoid hitting the quick (ever) if the cat is somewhat cooperative. Cats are easier because the nails are transparent and they have a more distinct shape for landmarks. The initial photos here are of cat nails, so I can point out landmarks and so you can see where the quick is. 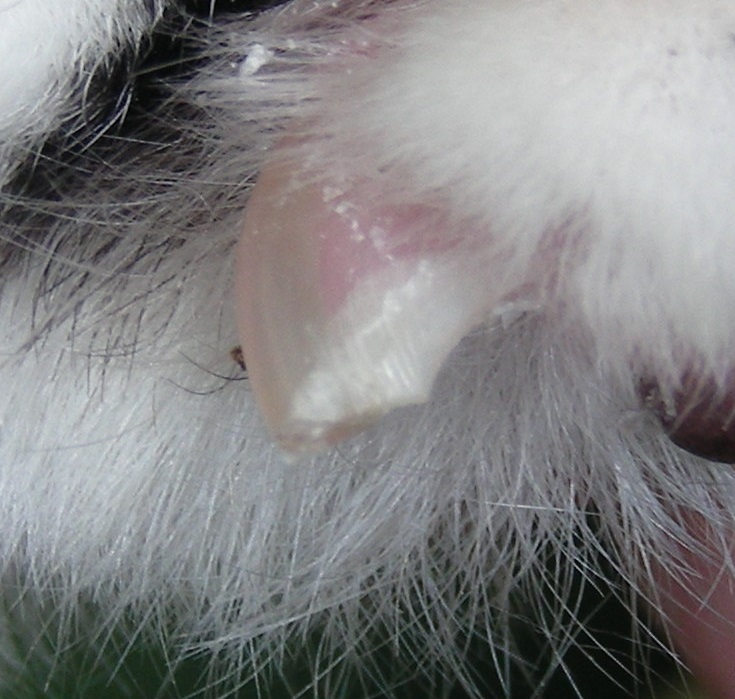 Dogs with clear or white nails also have visible quicks. It's the black and brown-nailed dogs that present the problem (but we'll help you with that, too). OK, here are pictures of cat nails to get us started. First thing to notice is that the front and back nails are slightly different shapes. 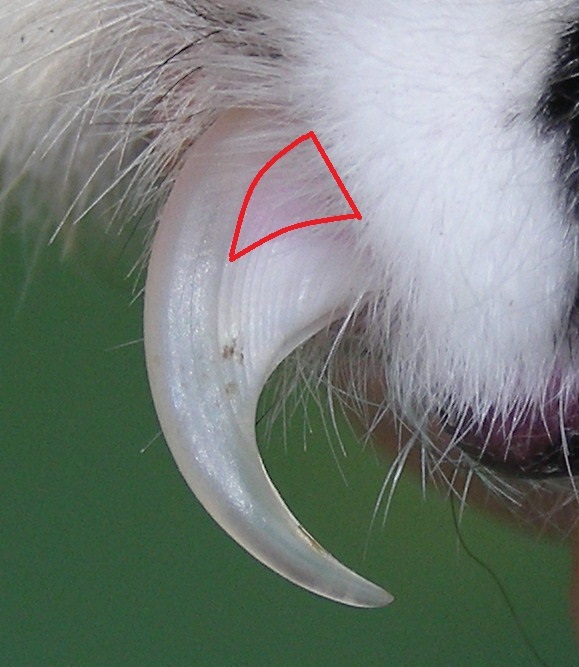 The front nails are more curved, the better to sink into prey. The back nails tend to go out straighter from the toe. Also, take a good look at the base of the nail. Can you see the pinkish triangle? That's the quick. Here is the same photo, doctored a bit to outline the quick in the nail. All you have to do is avoid this pink area when you cut. Easy, huh? Well, not quite so fast. What if you can't see the quick because the nail is pigmented or dirty? There are a few landmarks that will tell you approximately where the quick lies even in black nails. The first thing that I do is imagine a straight line coming out from the bottom of the toe, following the natural "underline" of the nail. I have drawn this line in red in the picture here. This is the underside of the quick. Where this line intersects the nail itself is usually the furthest extent of the quick down the nail, and this is usually where I will trim the nail. Another way to look at the nail is to see where the underside of the nail transition from straight to the downward "hook". This is most obvious in the front nail because of the more pronounced curve, but you can see it in the back nail, too. I've pointed this out with the red arrow above. You can see that the place where the red arrows point and the place where the lines hits the nail (last picture) are pretty much the same. I will use either or both of these landmarks for trimming the nail. And, finally , I trim at about a 45 degree angle on the nail. This dog (below) was in dire need of a trim. Most dog nails won't be this long. I've marked the bottom line (red line), as well as where I would aim for to do the trimming (white line). In reality (see the photo on the far right in this little series) I made my first cut a little bit further out than my goal - just in case. The quick was still far away, so I made another cut along the white line and all was perfect.